The five points area of Athens needs to fix a number of problems in order to be a great pedestrian neighborhood. Some of these fixes are more intensive and require changes in land use and zoning, but others are relatively minor and could be done rather quickly. One such minor change that could make the area more attractive to walkers is re-configuring the traffic signals and enhancing awareness to better protect pedestrians. Five points is difficult for pedestrians to navigate because, as the name suggests, there are multiple roads converging at a single point. The intersection does not have hard corners that require cars to come to a near stop in order to make a tight right turn. Consequently, cars are allowed to quickly round a corner, which leaves little time for cars to notice pedestrians (and pedestrians to jump out of the way). This is particularly a problem with south-bound cars making a right turn from Milledge Avenue onto either Milledge Circle or Lumpkin Street. Cars on Milledge could be traveling upwards of 40 mph and the rounded corner allows them to quickly turn onto either of the two streets. 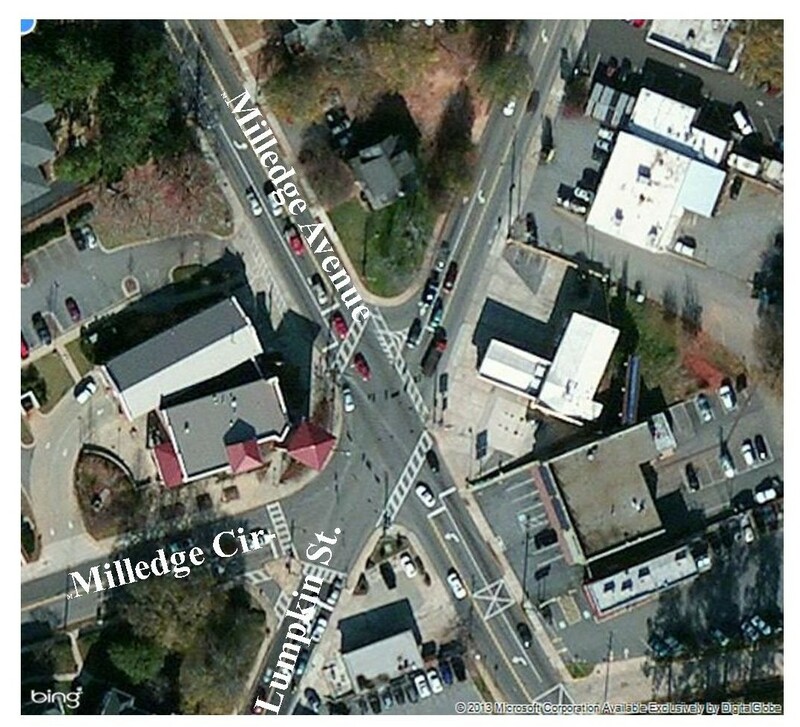 The fire station at the northwest corner of Milledge Avenue and Milledge Circle effectively prevents drivers from seeing pedestrians crossing Milledge Circle until the driver is practically at the crosswalk. Instead of working to protect pedestrians, the traffic signals seem to encourage accidents. As with any intersection, the walk signal to cross coincides with a green light. When cars have to slow down significantly to make a right turn and pedestrians can easily be seen, this is a fine configuration. However, when cars can make turns without having to significant slowdown and pedestrians cannot easily be seen, this is a death trap. The traffic signals treat a right turn from Milledge Avenue onto Lumpkin Street as a typical right turn – green light equals walk signal. However, most drivers probably would not consider this a true right turn. It’s more akin to a split in the road. Any natural awareness a driver may have for a pedestrian when making a right turn is dramatically diminished because this split in the road requires almost no deceleration. There is little difference between cars turning right from Milledge Avenue and cars heading straight on Lumkin in terms of expectations of encountering a pedestrians and speed. So while drivers don’t treat this as a right turn and don’t have the normal level of pedestrian awareness, the traffic signal is encouraging pedestrians to cross. Though the street is narrow and it only takes a few seconds to get across, telling a pedestrian it is safe to cross with a flashing white symbol when a great amount of danger still exists undermines the confidence the walk symbol is supposed to provide. A number of things could be done to better protect pedestrians without heavy infrastructure and re-configuring the intersection. First, the walk signal to cross Milledge Circle and Lumpkin could illuminate while all traffic lights are red. A right turn from Milledge Avenue would be permitted after a complete stop. This obviously would increase traffic delays because cars would have limited movement for a number of seconds. A less disruptive solution would be to just make drivers more aware of pedestrians. This could be done with an illuminated or flashing sign on Milledge Avenue that says watch for pedestrians. This could be on at all times or could be activated when a pedestrian pushes a crosswalk button. Another solution is to make the crosswalks brighter. Paint them a solid, bright color to distinguish them from ordinary crosswalks and encourage awareness. Flashing lights could be installed in the street that activate when the crosswalk button is pushed. The best solution would be hard corners with storefronts fronting the street (instead of parking lots), but until that happens Athens should better protect pedestrians with inexpensive measures.